The Royal Gorge Route has, quite possibly, one of strangest histories of the entire Rio Grande system. The initial part of the route - from Pueblo to Florence and then down the branch to the coal mines (later the Coal Branch) - was constructed as the final part of the narrow gauge Denver-Pueblo Main constructed in 1872. This connected the railroad to a source of revenue and fuel, but angered Canon City residents. Fremont County residents (primarily Canon City) had approved a $50k bond issue to lure the D&RG to town in 1871, and in the end didn't get their railroad. Two years later in 1873, the railroad asked again, but this time for $100,000. This time, despite a narrowly positive referedum, the county commissioners didn't go for it and didn't give in to the railroad's terms. Canon City residents, however, decided to go it alone, approving $50k in cash and $50k in land grants in early 1874. This time, rather than holding out for more cash, rails were completed into Canon City on 6-Jul-1874. Construction stalled at that point for several years while the Rio Grande pursued routes southward and battled ongoing problems with debt. Eventually, the D&RG found itself leased out to its arch-rival, the AT&SF. Through a subsidiary - the Pueblo & Arkansas Valley - the AT&SF built westward through the Royal Gorge in 1879 towards the booming lead and silver mining districts around Leadville. The P&AV completed 22 miles of track through the Royal Gorge (known at the time as the Grand Canyon of the Arkansas) from Canon City to Texas Creek - including the famous Hanging Bridge? - in the same of the Santa Fe. However, the victory was short-lived. As a condition of the Treaty of Boston?, the P&AV track through the gorge was sold to the D&RG in 1880. To make the line useful, it was extended another 89 miles from Texas Creek to Malta, at the base of the hill below Leadville. Various branches sprouted from that point towards the actual mines near Fremont Pass. 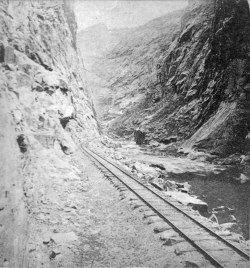 See more photosThe line remained narrow gauge until 1888, when it became one of the first routes converted to dual gauge. Partially this was done to handle the heavy freight coming out of Leadville, but primarily this was done to provide a standard gauge route west in order to compete effectively with the ever-expanding Colorado Midland. The dual gauge also lasted longer than it did nearly anywhere else, with the third rail between Salida and Pueblo lasting until 1911, presumably because of the narrow gauge Calumet and Monarch Branches, as well as the narrow gauge mainline over Marshall Pass. Two major route changes have occurred since the line was originally constructed. The first came with the great Arkansas River flood of 1921. The flooding decimated the line, particularly the Canon City to Pueblo segment, requiring nearly the entire stretch to be reconstructed. The second occurred with the construction of the Pueblo Reservoir in 1969. The dam would impound the waters of the Arkansas from just above Pueblo back to just above Swallows, flooding the original D&RG right of way under more than a hundred feet of water. The new route was moved to the north side of the new reservoir, with the old line removed west of the dam in 1969. The section east of the dam survived until 1976, as it was used to assist in construction of the dam. Despite efforts to shut down the Royal Gorge Route and Tennessee Pass, the line survived as a vital link in the system through the D&RGW era and the SP era. The UP era, on the other hand, wasn't so kind. Only just shy of a year after the UP-SP merger, on 23-Aug-1997, the last train went over the pass. The train was OMIGV-19, a westbound unit taconite train with two units on the front and three in the middle. It departed Pueblo at 1125h and pulled into Minturn at 2005h. In 1998, the Pueblo-Parkdale section was sold to Rock & Rail? and the Canon City & Royal Gorge, with Union Pacific maintaining trackage rights. The Canon City & Royal Gorge runs regular tourist trains through the Royal Gorge. Rock & Rail? runs (or at least used to run) rock trains from the Parkdale quarry to Colorado Springs, as well as provides switching services for the cement plant at Portland.